Journal : Ophthalmic Hospital Reports and Journal ; vol. xi. London : J. & A. Churchill, 1887. Description : 429-455 p., [1 l] pl. ; ill.: 1 phot., tbls. ; 22 cm. Photographer : Dr. Edward Treacher Collins. 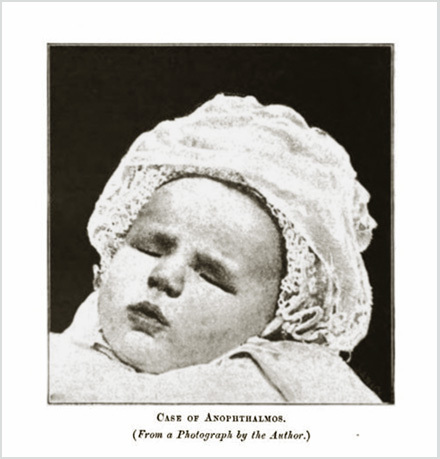 Subjects : Eye — Congenital deformities ; Anophthalmos. Author caption: By E. Treacher Collins, Senior House Surgeon. Medical degree, Middlesex Hospital, 1883. Interned, Royal London Ophthalmic Hospital, Moorfields, 1884. Pathologist and Curator, Royal London Ophthalmic Hospital, Moorfields, 1886-94. Surgeon, Royal London Ophthalmic Hospital, Moorfields, 1895. President, International council of ophthalmology, 1927. Eponym: Treacher Collins syndrome (TCS) – autosomal, congenital disorder distinguished by mandibulofacial dysostosis. Photo caption: From a photograph by the author. First broad study of anophthalmos, with an extensive review of the literature.